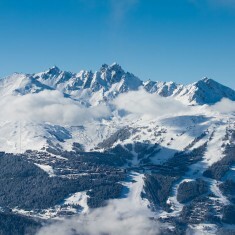 Courchevel | Courchevel | Ecosign Mountain Resort Planners Ltd. 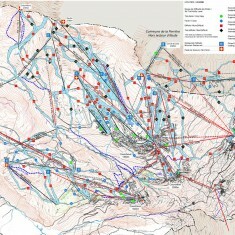 In the spring of 2010, the Mairie de Saint-Bon Tarentaise issued a public tender for the preparation of a master plan for the Courchevel Ski Area. 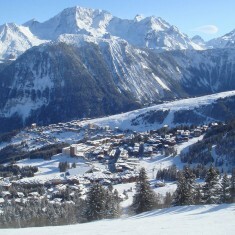 The objectives of the tender by the City Council of Saint-Bon was to determine the prospects for infrastructure (ski lifts and associated pistes) on the horizon for the next ten to fifteen years with a greater objective of returning Courchevel to its stature as one of the leading ski resorts in the world. As part of the renowned Les Trois Valleés in France, Courchevel represents about forty percent of total skier visitation in the region that also includes Méribel, Val Thorens and Les Menuires. Courchevel is the largest of the four ski areas with 57 lifts and 93 ski pistes covering a total distance of 150 kilometers. Ecosign was awarded the Master Plan contract in cooperation with our partner CIME (Conseil & Ingénierie de Montagne et Environnement) who was able to provide invaluable local expertise. Ecosign completed technical assessments of some 5,900 hectares (59 square kilometers) including analysis of elevation, aspect/orientation, solar shading, and slope gradients. We thereafter completed a Terrain Capacity Analysis to determine the optimum capacity of Courchevel, which maintains high quality skier density and ideal conditions on the pistes. After careful study, Ecosign and CIME proposed to retain 27 of the 57 existing lifts, remove 30 lifts and install 16 new lifts. The total number of lifts would drop by 25% thereby reducing operating and maintenance costs at the same time as providing greatly enhanced customer convenience and comfort. Ecosign also collaborated with Wilmotte Architects to study the redesign of the famous Croisette area by amelioration of the unneeded lifts from Courchevel. The Mairie du Saint-Bon has reviewed and accepted the new Master Plan and implementation of the project is underway. Total cost for the entire Master Plan implementation is €96.7 million over a ten year period.